Huawei wants you to see how amazing the processor is on the Huawei Ascend P6. At 6.18mm thin, it is not only the thinnest smartphone on the market, it also features a home grown quad-core 1.5GHz K3V2 processor under the hood. 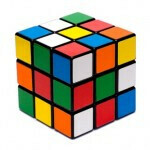 To show off the phone, the Huawei Ascend P6 was called upon to solve a Rubik's Cube. An ARM engineer named David Gilday helped set up a Lego Mindstorms machine so that it would be powered by the Ascend P6. Gilday explained how the process works. The front-facing camera is employed to take pictures of each side of the cube, and starts working on a solution by using an algorithm. The engineer says that the quad-core processor and the 2GB of RAM combine to help solve the problem. A Bluetooth connection allows the phone to communicate with the Lego Mindstorms, which also has an ARM based processor inside. For the record, with the Huawei Ascend P6 as its brain, the Lego Mindstorms solved the cube in just 49 moves. The Ascend P6 is indeed amazing. Good Job Huawei! Particularly as it has a new unknown processor, what we need is a thorough comparative review of the P6 comparing it with the major current top end, eg GS4, HTC 1 with tables of all the major benchmarks. The same goes for the Lenovo K900 as that also has a new processor, which being Intel, has only has a controversial ABI benchmark sponsored by Intel. So far as the P6 specs go, it seems to have all the features I want, but why oh why did they not use the current Bluetooth 4 standard ? Yes but how much moves will it take for them to complete it?